The man who drove his truck into a crowded schoolyard on Wednesday in Guangdong province, killing five people and injuring 20 others, did so "because he was tired of life", police said on Thursday. The driver, referred to only as Luo in a police statement, drove into a crowd of students who were leaving Chengdong High School in Baijiao, Zhuhai, at about 5 pm. In the statement, Yu Changli, spokesman for the Zhuhai public security bureau, described 34-year-old Luo as a "quiet, introverted and cranky" man who was on the brink of divorce and came from a family with a history of mental illness. His wife left with the couple's 1-year-old son after a quarrel three months ago, he said. When his truck business fell on hard times, the Hubei native became a motorcycle taxi driver. On Oct 22, he was stopped by police who found the bike had false plates and confiscated it, the statement said. The lack of a stable source of income and a family to fall back on drove Luo into despair, which culminated on the day of the attack, it said. At about 2 pm Wednesday, Luo went to the traffic police to inquire about his motorbike fine. He was told he had to pay 1,000 yuan ($150) and would have to pass a test to regain his license. He then left and drove his truck back home. 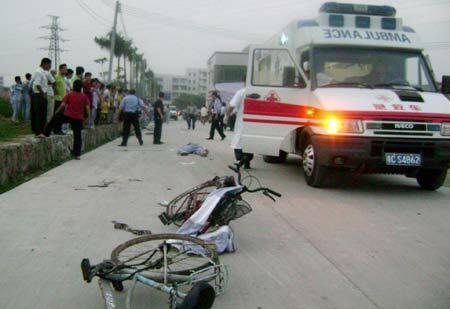 He hit two people outside Chengdong School, the statement said. A security guard at the school jumped onto the truck and tried to stop him, but he fell off, it said. Another guard contacted the police when Luo rammed into the school's northern gate after hitting a number of cars. Luo, whose grandfather suffered from mental illness, hit more than a dozen students as he drove across the school and exited from its southern gate, the statement said. Police then chased Luo as he drove his truck toward a busy local market, it said. When Luo ignored warning, a police officer opened fire. Luo died at the scene and his truck stopped after colliding with a parker van, the statement said. Luo killed four students and a 49-year-old man. Four of them died on Wednesday, and the fifth died in hospital on Thursday. Classes at Chendong High School were suspended on Thursday as a mark of respect. Zhou Zhiwei, a 13-year-old student who witnessed the incident, said he saw a body hanging from the truck when it drove into the yard. "We were very scared and all the girls began to scream," he said. Tan Mei, an official from the local education bureau on Thursday said they would invite psychological experts to hospitals and the school to help students and teachers. "I'm worried about my girl's mental state," the mother of Liang Chunmei, a student who sustained bruises in the incident, said.